‘Build Your Grill’ concept features stellar cuts of meats, but needs a bit of tweaking with the sauces. Khar’s Radio Bar known for its well-priced alcohol and regular bar food is now armed with an all-new menu. 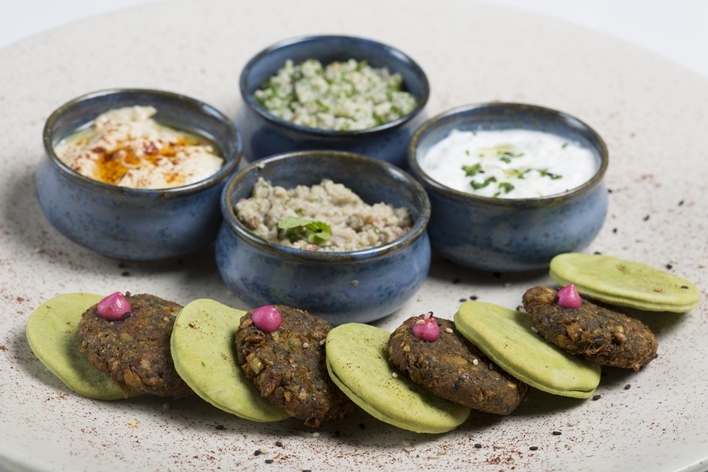 There are over 30 different types of bar bites to choose from and chef Rohan D’souza has also introduced a popular Australian food concept using a lava stone grill. 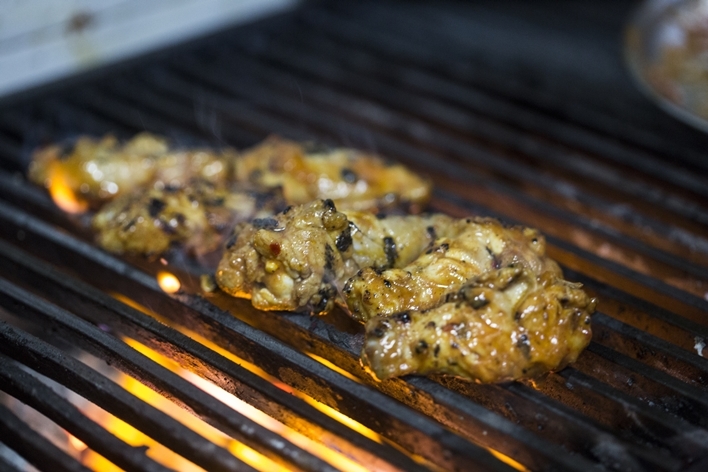 The ‘build your grill’ approach to grilled meats is directed towards allowing diners the option of pair their preferred cut of meat along with a selection of sauces, in a one-sauce-fits-all-meat theme. Meats on offer include lamb chops, salmon, chicken, lobster and prawns that can be paired with six different types of sauces in a DIY grill concept (served with house-cut, spiced sweet potato wedges). The quality of the meat is stellar, the chicken was succulent and tender, lamb chops perfectly medium rare. The sauces include options such as Chilly Tamarind, Tomato Chorizo, Coriander Lemon Pesto, New Orleans Smoked Pesto, Pepper Red Wine Jus, plus a Sundried Tomato Butter Garlic. We paired our salmon with the pesto and loved every bit of it – it had a refreshing, light flavour, maybe, a bit too light, just like the pepper wine jus that we chose with the lamb chops. The jus is fragrant and has a smooth consistency, but lacks punch. Our hunk of soft chicken was teamed with the chilly tamarind sauce that is the star of the selection. It’s got enough spice and heat to wake up your taste buds without being too strong, but they do need to dial back a bit on the tartness here, lest it overpowers the delicate flavour when teamed with salmon. Also, try the kaffir lime-infused Radio Mojito. It’s deliciously balanced with orange juice, and made for a nice pairing with all the meat. The bar bites are truly a step up from the fare served here before, and we quite liked the sharing Lebanese Mezze Platter with pumpkin falafel, pita diskettes and four types of dips – tabouleh, fragrant burnt garlic hummus, tzatziki and Babaganoush that we just couldn’t get enough of. Lamb sliders here are served in a slightly gimmicky cage, but all is forgotten once you bite into the succulent, mildly spiced patty finished with cheese sauce and a tangy tomato compote. And if you’re looking for the perfect drink to go with this, do call for a few rounds of the Sangria which mixes in grape juice, red wine, apples and tequila for a concoction that packs in just enough punch without being cloyingly sweet. 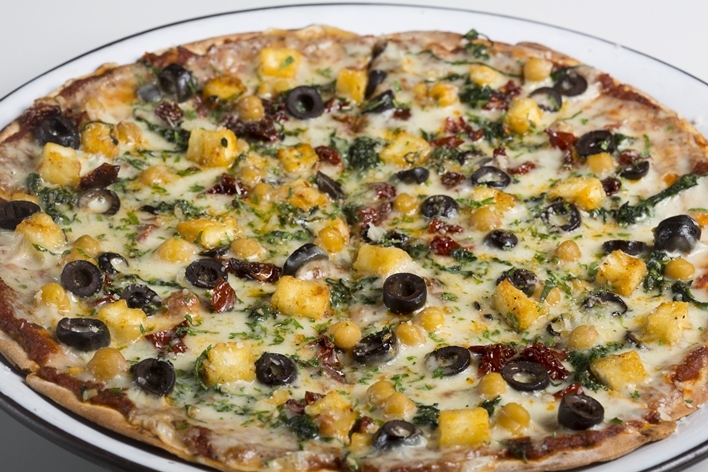 Thin-crust Pimento cheese, spinach and garbanzo beans pizza pairs well with some chilled beer. The Bacon and Cheese stuffed Potato Skins were creamy and well-baked, albeit a touch too sweet from the bacon vinaigrette. Crostini with chickpeas, spinach and sundried tomatoes will find favour with vegetarians and meat-lovers alike and we advise repeats of the Grilled Chicken Rolls with Chorizo and Salsa. For seafood lovers, Barbecue King Prawns – finished with bird eye chilly and pineapple dressing – were equal parts juicy, spicy and tangy and are highly recommended. If you’re the kind to instinctively pick a pizza and beer on a night out, there’s a thin crust loaded with pimento cheese, spinach, garbanzo beans, sundried tomatoes, chicken, cottage cheese and olives.